← Frostproof, Florida. January 11th, 2010. A sinkhole has officials rerouting the Olympic torch when it comes to one Calgary neighbourhood next week. The cross-Canada torch relay will reach Calgary on Jan. 18, the first time the torch has been in the city since it hosted the Winter Olympics in 1988. The glitch in the route happens the next day, Jan. 19, when the torch is set to tour through the neighbourhood of Crescent Heights. First Street N.E. has been completely blocked off since November between Fifth and Sixth Avenues due to a sinkhole. The hole in the street is next to a construction site where the city is building a new emergency operations centre. 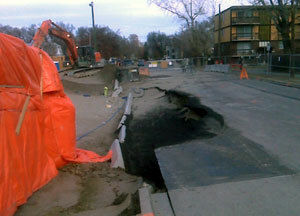 This entry was posted in Pictures and tagged Calgary, Canada, sinkhole. Bookmark the permalink.